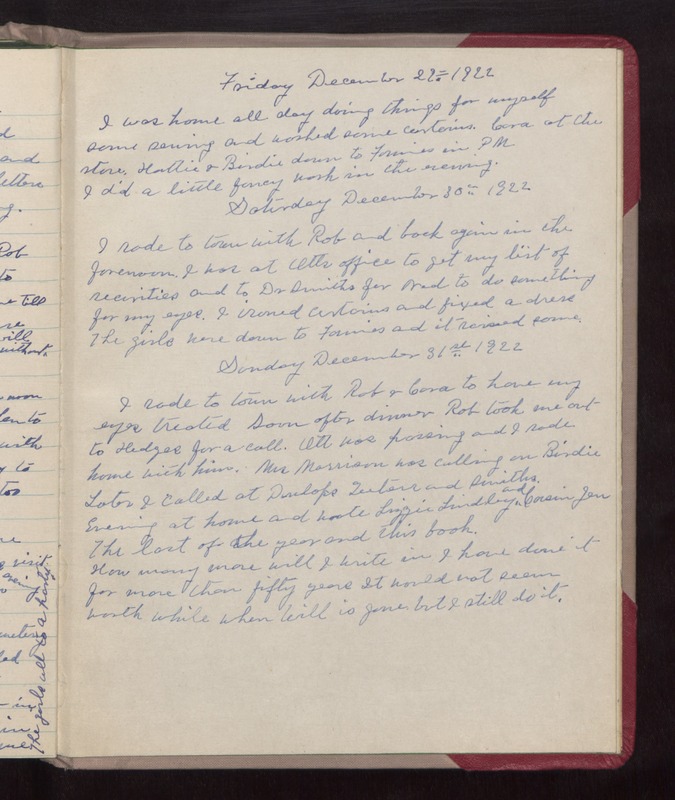 Friday December 29, 1922 I was home all day doing things for myself, some sewing and washed some curtains. Cora at the store. Hattie and Birdie down to Fannies in PM. I did a little fancy work in the evening. Saturday December 30th 1922 I rode to town with Rob and back again in the forenoon. I was at Otts office to get my list of securities and to Dr Smiths for Ned to do something for my eyes. I ironed curtains and fixed a dress. The girls were down to Fannies and it rained some. Sunday December 31st 1922 I rode to town with Rob and Cora to have my eyes treated. Soon after dinner Rob took me out to Hedges for a call. Ott was passing and I rode home with him. Mrs. Morrison was calling on Birdie. Later I called at Dunlaps, Teeters, and Smiths. Evening at home and wrote Lizzie Lindley and Cousin Jen. The last of the year and this book. How many more will I write in I have done it for more than fifty years. It would not seem worth while when Will is gone but I still do it.